Raymon Pici grew up in the Lower Mainland in British Columbia. He graduated from Simon Fraser University in 1997 with a Bachelor of Arts in Criminology. He then graduated from law school at the University of Saskatchewan in 2001. He was called to the bar in 2002. Ray has been working in the area of motor vehicle accidents since that time and joined Cowley & Company in June of 2012. Ray chose to work at Cowley & Company as we are an exclusively plaintiff oriented firm. 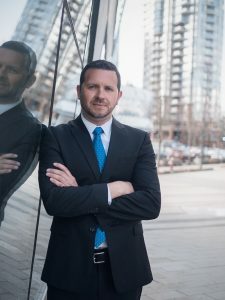 After years of acting on behalf of insurance companies, he felt it was time for a change and wanted to help those in need of legal assistance. When he’s not working, Ray enjoys spending time with his family, playing guitar and and has recently taken up rowing (sculling).